This map shows a bird's-eye view of a landscape near Ness City, Kansas. Printed in three colors, the map includes an inset map at upper right featuring a proposed four-state canal system extending from South Dakota to Oklahoma. The main illustration depicts a dammed Walnut River (actually, Walnut Creek) crossing a canal that stretches to Ness City on the horizon. A public highway parallels the canal, which is surrounded by lush irrigated fields and prosperous farmsteads. 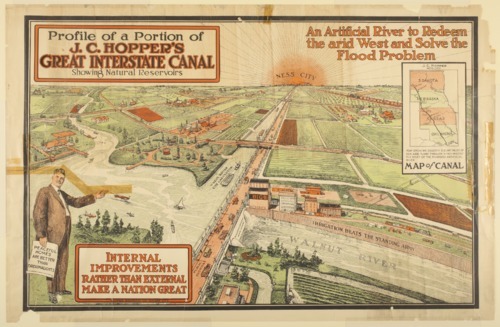 The canal was the brainchild of J. C. Hopper, a Ness City banker who hoped to dam western waterways and dig a four-state canal that took advantage of the natural decline in elevation from north to south. Hopper gained the support of U.S. Congressman George A. Neeley (also of Kansas) and hoped to get government backing for the canal, but it never materialized.